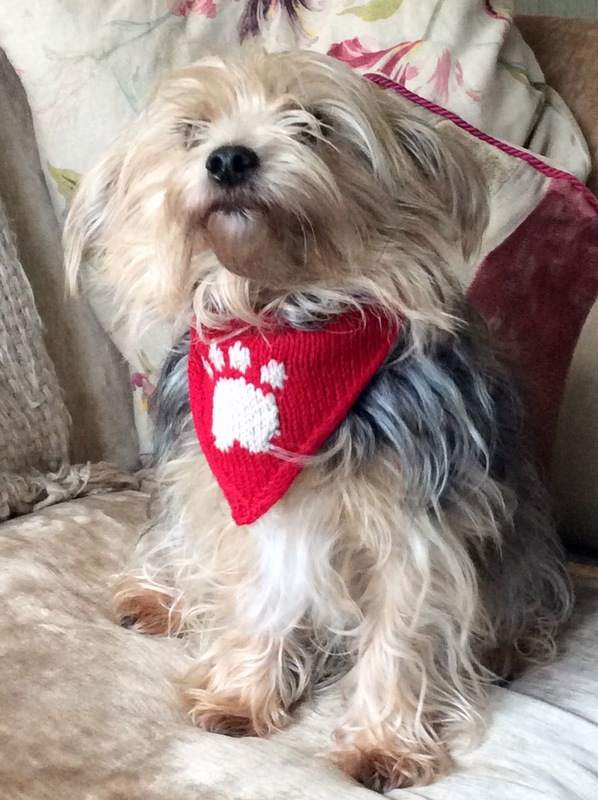 Remember the doggy bandana I knitted for Miekie (seen here modelled by Tess) as part of last year’s Stitching Santa? 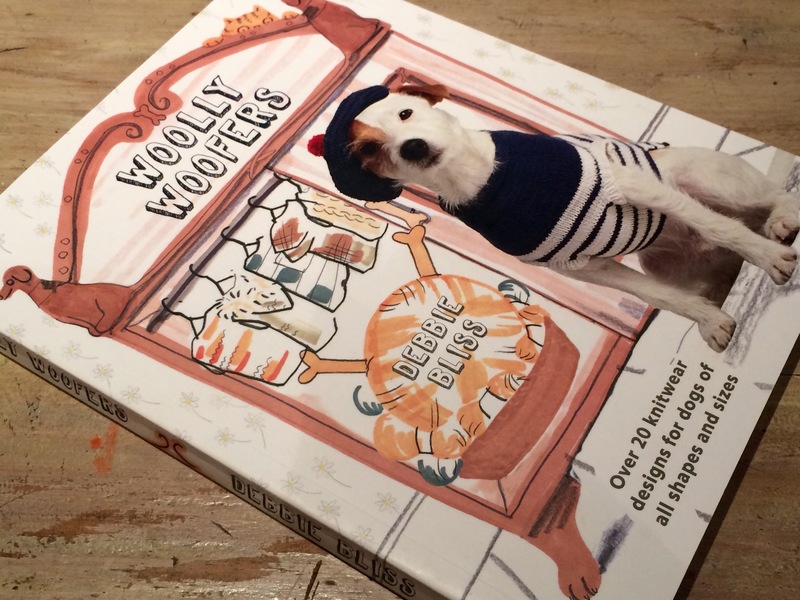 It was from the book Woolly Woofers by Debbie Bliss. 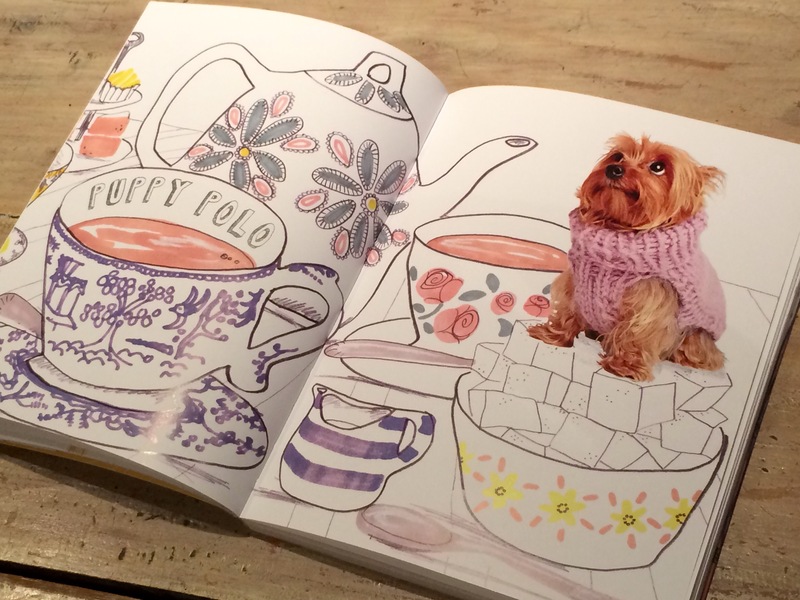 I bought it as much for the quirky illustrations as for the actual content – just look at this backdrop for the so-called Teacup Yorkie! Well, our other Yorkie, Fifi, has been to the Vet’s a lot recently as she’s an old dog that needs a bit more regular attention. She is much happier wearing a dog coat than those awful cones, but she doesn’t really have enough. I thought this little coat would be a quick and simple knit to go with the fleecy coat I made the other week. Most of the coats in the book are in there sizes; small,medium and large, but this particular design was specifically for Toy breeds and only available as ‘one size fits all’. I should have been wary at that statement as both Tess and Fifi are a Toy Yorkshire Terrier, yet Tess is literally twice the size of Fifi. Undeterred, I cast on using a super chunky yarn in two colours which were dictated by the two half-balls of Lion Brand that had been languishing at the bottom of my ‘leftovers’ bin for months now. There should just about be enough to make a tiny coat. The gauge was only slightly bigger than the tension gauge suggested in the pattern so I carried on to the end, playing yarn chicken (again!) and winning with just 6″ to spare. 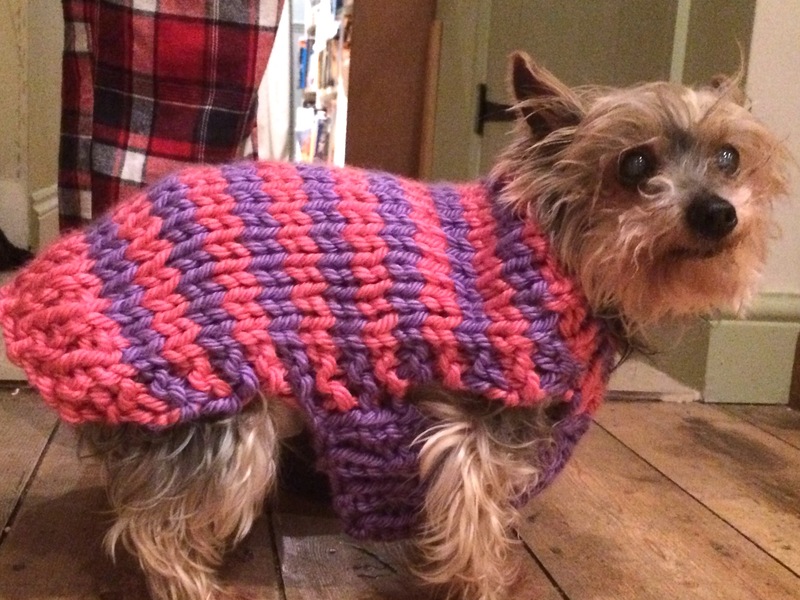 I tried the finished coat on Fifi and…. It could probably have gone around her twice and the end flopped well past her tail. She even looked the other way in an effort to communicate her humiliation. So I tried it on Tess…..and it fit perfectly. It looks just like it does in the book – nice and snug around the chest and not too long in the body. She was even happy to pose for the camera. 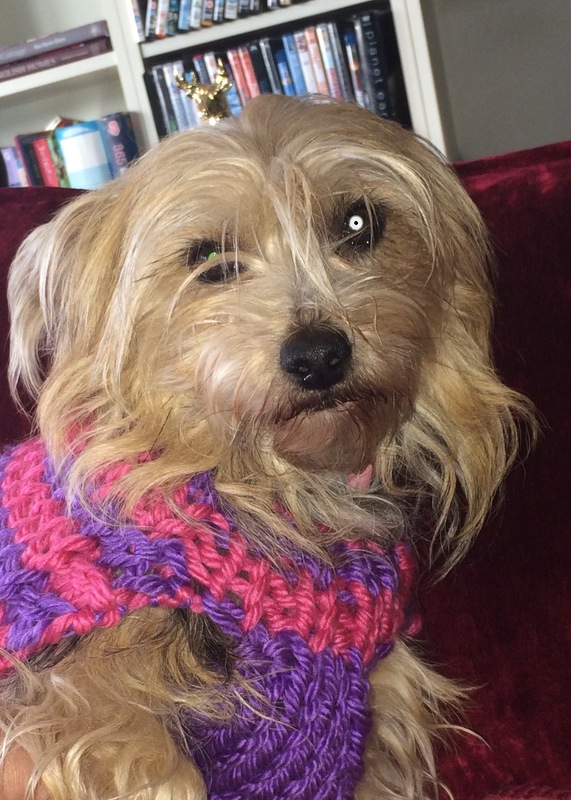 There’s only one tiny issue, and that’s the fact that she has thick hair (and lots of it) and never really gets cold enough to warrant wearing a coat, so if anyone has a little dog that would wear it, let me know and I’ll send it to you. 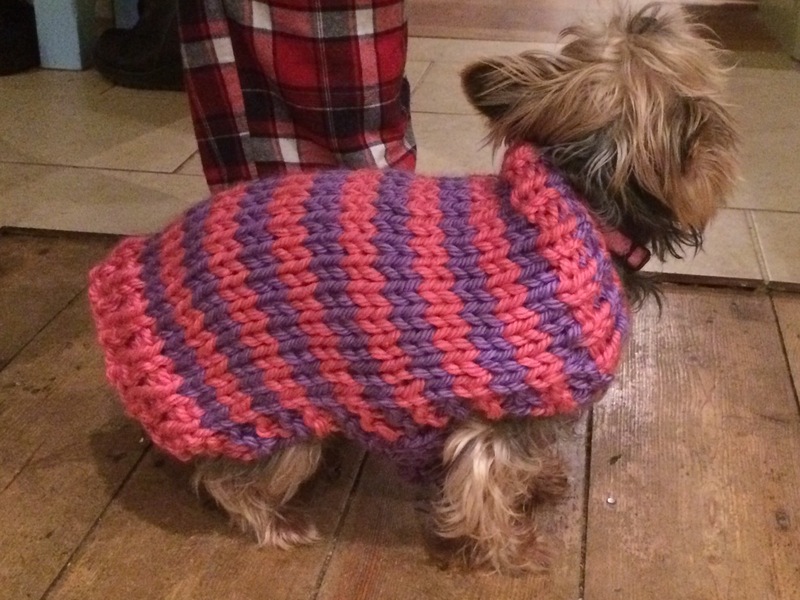 Categories: Knitting | Tags: coat, dog, knitted, woolly woofers | Permalink. Awwww poor Fifi. It is bad when you are too small to wear a small coat. Bless her heart. No doggies here. Hopefully you can find a little one that can use it. It is cute as can be. Maybe you can alter it to fit her. You are the queen at the sewing machine! I’ll give it another go with thinner yarn and smaller needles – I need another evening project anyway. I don’t think it can be altered to fit on the sewing machine, unfortunately. 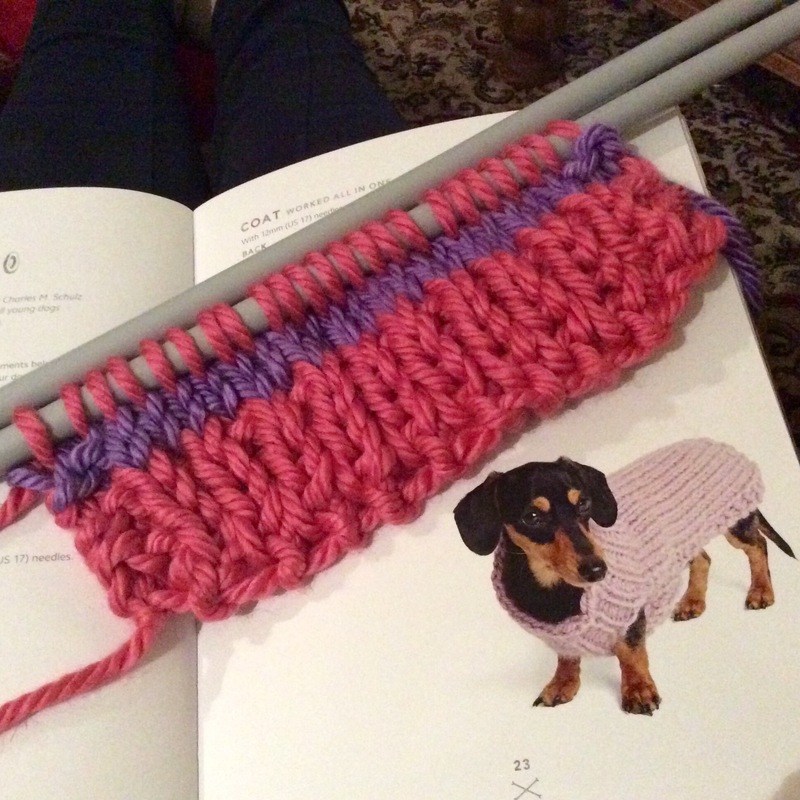 I was just trying to use up some odds and ends of yarn and it worked – apart from the fact that it doesn’t fit! Yes, I’ll try again with smaller needles. Aww, they both look so cute! 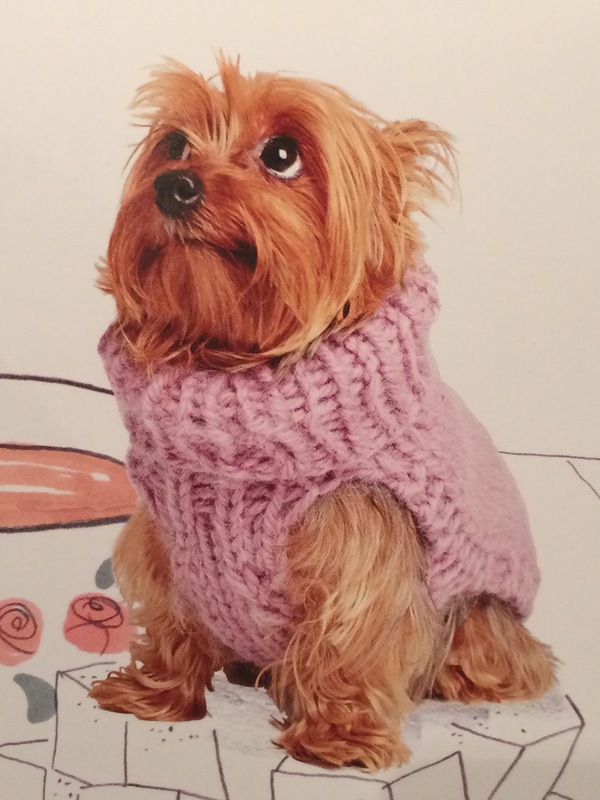 I know – any dog in a coat can’t fail to look cute! 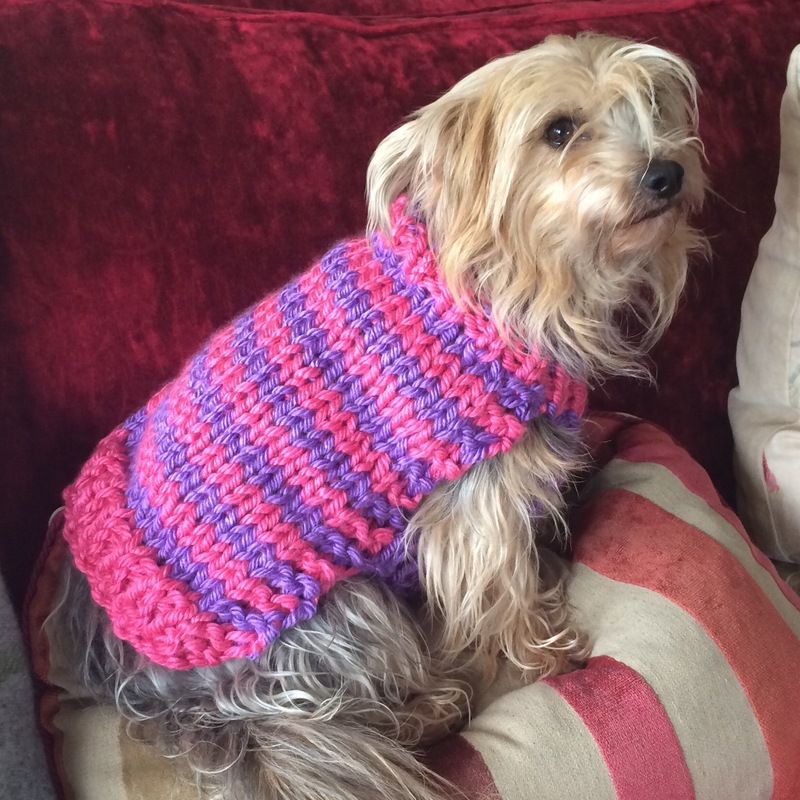 It is a shame as the yarn is really soft and cosy for her – and I quite liked the colours, too. 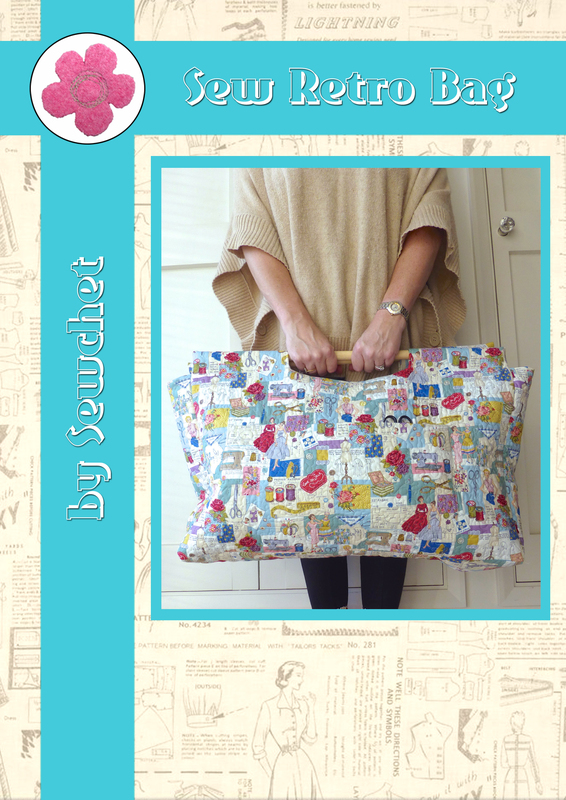 I don’t think it can be taken in on the sewing machine, unfortunately, so I’ll just have to make another one. Oh dear! Better try again with slightly thinner yarn I guess!!! Yep, that’s the way forward! It looks lovely on Tess – it’s a shame it doesn’t fit her. I’m sure you’ll be able to adapt the pattern now to make another for Fifi who needs it most. Yes, making another one that actually fits shouldn’t be too much of a problem I don’t think, and she does love to wear a coat. Luckily, it was a quick make so I can make another one that (hopefully) fits. It didn’t occur to me that dogs with only three legs can’t swim – obvious, now I think about it. I don’t suppose Hicks has ever needed a coat, judging by the look of his fur! I can picture his forlorn look whilst modelling, too! No, and can you imagine how wet and muddy it would get if he did?! Will see if I can dig the pic out and make a wee blog post of it. It’s a good phrase, isn’t it? Not my invention, I might add, but it describes it perfectly. 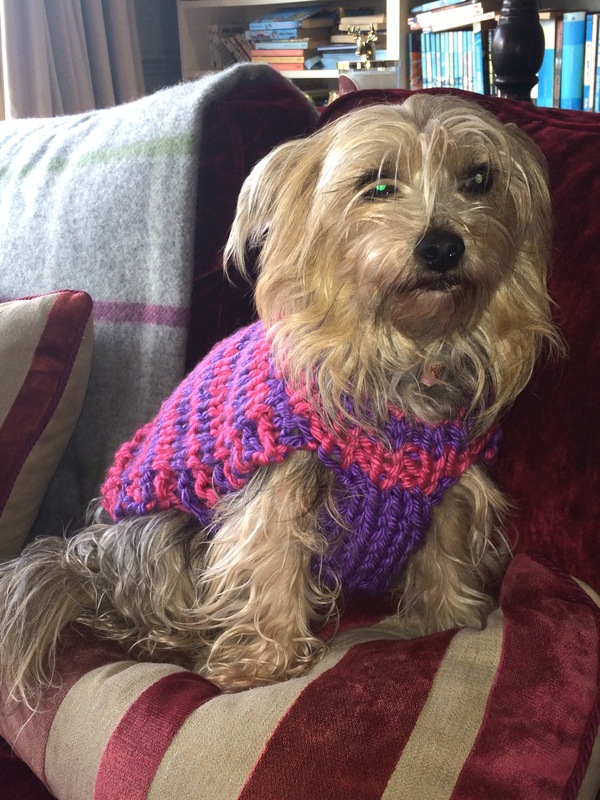 So sorry the first version hasn’t worked out for you, Sheila, but know the second one will be keeping her comfy soon! Thanks Del, I’ll try again with smaller needles and yarn! She does look very very cute. Fifi looks so cute, and cuddly. I totally understand her need for coats and sweaters. After years of Miekie not wanting to wear them at all, she now loves them, as she is also getting older and appreciate the extra warmth, specially when I am at work and the heaters are not on in the house. Lol, but her look says everything. 🙂 She will await a second attempt I am sure. Enjoy the week, I hope it is a lovely Spring week, we are still enjoying warm days and rains. No sign of Fall just yet. No luck with nice Spring weather yet – I think this has been the wettest week so far! Still mild, though, so Fifi doesn’t actually need a coat on all the time. She stands there shivering, staring at me if she gets cold and I swear I can see her smile when I put a coat on her! We shall send Spring to you in a bit. You know they hate it when they refuse to look at the camera! Classic humiliated pose by Hicks – poor thing! Thanks! It went to a dog charity in the end. Oh good grief – Hawaii?! I dream of going there one day! 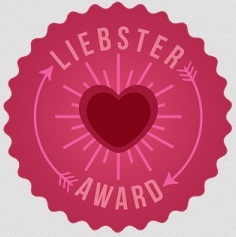 I’m not surprised – what a post!